TailMe is an utility providing functions similar to the UNIX command "tail": it lists the last changed lines/characters in a text file. You can always see changes taking place in the file on the fly. It is very usefull for monitoring log files of applications - e.g. 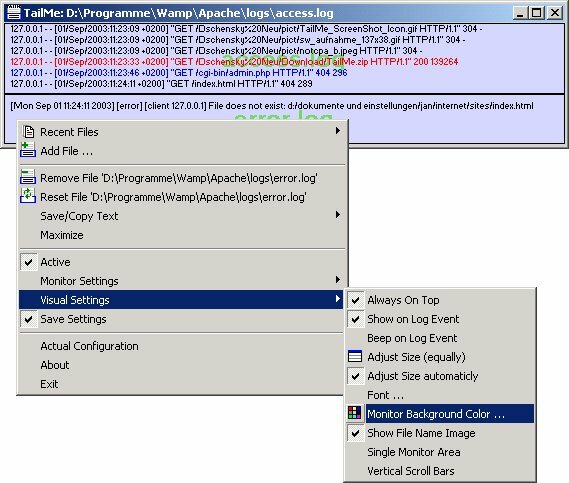 Apache's "error.log" and "access.log". To reload different monitor jobs you can define configuration files and hand them over to "TailMe" by a command line parameter (example is included). TailMe can monitor several log files at the same time. For every file a TRichView component is dynamicly created. The using of TRichView's format functions makes it possible to create more expressive outputs than the standard "tail" command can do.